For the second year in a row my Christmas maple dessert turned out not at all as I expected. When it happened last year, I stayed calm. This year it lead to the baking equivalent of a hissy fit. I was on a mission to make something packed with maple flavour so the less ingredients the better. Shortbread was the perfect solution especially after my brother proclaiming his love for it. And with only three ingredients, how difficult could it be? (I'm like the "I'll be right back" guy in horror movies). A bit of research told me that the best way to extract the most maple flavour for shortbread was to make a maple butter. Essentially turning three ingredients into two. So easy. However, I found two types of recipes for maple butter; one with more maple syrup than butter, and the other with the opposite. Decision number one (for better or worse) was to make this ratio one-to-one. It seemed like the lesser of three evils (wait..?). Making the maple butter itself is not hard. Though for some reason I felt it necessary to use the entire bottle of maple syrup (all 375ml of it *eye-roll*). But when it was done I had high hopes. The texture was odd, what I imagine sap from a rubber tree to be, but the flavour was outstanding. I almost wanted to stop there and start toasting some bread. I made a few test cookies that turned out okay, perhaps a bit under baked. I increased the bake time and made a full batch (around sixteen cookies). I took them out of the oven, let them cool for a minute or two, decided they weren't done, and tossed them back in the oven for a few more minutes. All while working on the second batch. Just before I was ready to bake the second batch I went to test the previous one. It was at this point that I decided that there was no way they were going to turn out. The most frustrating part about this recipe not turning out as planned is the amount of time it takes from beginning to end. Make the maple butter, chill the butter, bring it back to room temperature, make the cookie dough, bake the cookies. It's not a short process. To have it all go wrong so close to finishing and after being in the kitchen for eight hours plus, felt like a disaster. In a fit of rage I grabbed the unbaked cookies I had prepared and angrily hurled each one into the remaining dough ball; picked that up, slammed it on to a cookie sheet, rolled it out to a quarter inch thickness and baked it all at once. Twenty minutes later I had a giant, thin, crispy cookie. What had I done? 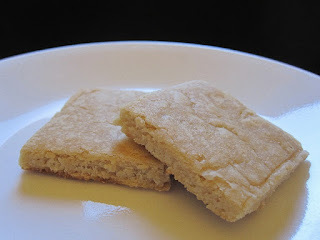 At this point I was so worried that I made butterscotch blondies as a backup. Then it was Christmas Eve. When I opened the cookie tins the next morning the smell of maple emanating from the container was quite powerful. I once again did a taste test. I was shocked. The cookies were good, a little too good. 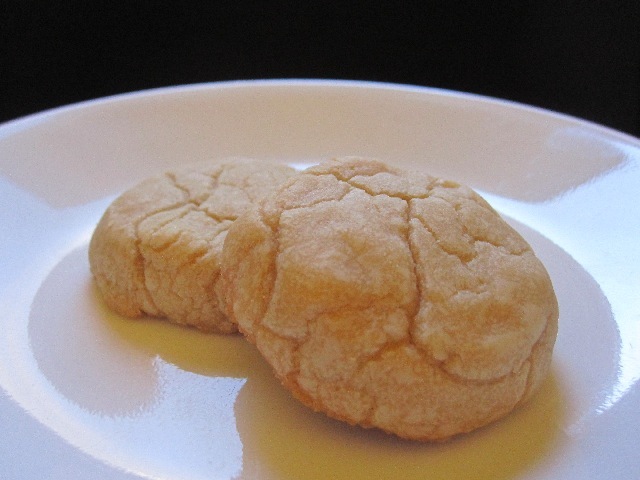 The round, thicker cookies, were soft in the middle and crisp all around, more so on the bottom. You got a hint of shortbread flavour and a bit of the texture, but it had good maple flavour. The thinner square pieces were crisp throughout, a little more shortbread in texture, and again, good maple flavour. Perhaps in the middle of the night my cookies were visited by tiny elves that specialized in cookies rather than shoes. Maybe they were Keebler Elves? But however it happened, the cookies were good. Everyone seemed to agree. I felt like the Grinch realizing that he couldn't stop Christmas from coming. Despite everything that went wrong and despite having flat, thin, oddly shaped cookies mixed inexplicably with thicker rounder versions; the cookies were good just the same. Truly a Christmas miracle. And as with most things maple, the flavour only got better with age. By the second and third days the maple flavour was much fuller and more pronounced. If I could be eating them right now I would be. My one regret is that I wish I had attempted to bake the cookies before adding the extra flour. Perhaps this would have produced the familiar crispy, melty, shortbread texture. There are probably better ways to go about baking these cookies (more sane ones at least). But whatever. The cookies were good (better than good). Next year though, I think I might save the maple syrup for pancakes :). Attach a candy thermometer to a medium saucepan and over medium-high, heat until temperature reaches 240F / Soft Ball stage (approx. 15 minutes). Remove from heat and add butter. Stir until completely combined. In the bowl of a mixer beat until light and fluffy. Remove maple butter from fridge and allow to come to room temperature. In the bowl of a mixer beat maple-butter until creamy. Slowly add the 3 cups of flour until completely incorporated. If texture is still sticky and difficult to work with, add extra 1/2 cup of flour. Pull rounded teaspoon sized pieces of dough from bowl (I found between 18g to 20g the best) and roll into ball. Flatten until 1/2 inch thick. Bake for 15 minute or until sides are golden brown. Allow to cool on cookie sheet for two to three minutes before moving to rack to cool completely. Roll dough out to 1/4 inch thickness. Score the dough in a grid and bake for 20 minutes or until edges are golden. Break cookies on scored lines. Of course, many desserts (like brownies and fruit cakes) are famously better only after waiting until they 'ripen'...these cookies sound really good, I'd love to hear if you make them again so you can get a 'formula' for making them perfect--although it is possible that, much like with some bread and biscuit recipes, you'll always have to judge the stickiness and workability of the dough by eye. Glad I got a laugh :). I catch myself with the "I'll be right back"-esque phrases all the time. Even knowing all the horror movie rules, I'd still probably be the first to check if the killer is dead, and then go running blindly into the forest. I would really love to make these again, because I did enjoy them, maple syrup is just expensive, I think I have to order it in bulk this year to make up for the cost. Ripen is a great word to describe the flavour difference with age. I'm gonna steal that one :). Maple baked goods always need to ripen :). And shortbread dough in general seems to be one of those where you have to judge it by eye and touch to see when it's ready and not rely entirely on the recipe. But this dough was especially odd :). Well maybe I'll make something maple next year and we'll call it your engagement present :).